These English courses and qualifications are for candidates whose first language is not English and they assess the four skills of Speaking, Writing, Listening and Reading. The topics and tasks covered are relevant to learners and are related to everyday work, study, community and social situations. The qualifications also offer people an introduction to various aspects of everyday life in the UK. 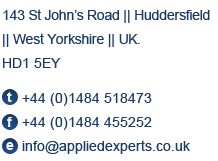 Applied Experts is a trading name of Applied Experts Limited which is registered in England and Wales, registration number is 7823042.